It’s a simple task to breath in and out but to be mindful and present with it takes practice. And this practice can help make positive, effective, and even transformative changes to our lives. Breath is just one form of meditation that can make an impact — there are many objects of meditation — but the breath is a good place to start as it’s available at any given moment wherever you are in Brick City. 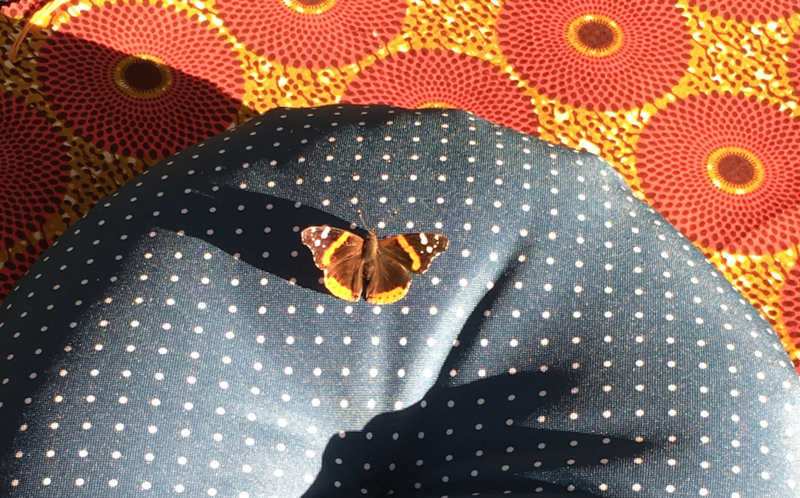 A butterfly stops to mindfully breath on one of our meditation cushions at the start of one of NCMC’s summer meditation classes held in Military Park through August, each Wednesday evening at 7pm weather providing. This entry was posted in Breath Meditation, Insight/Vipassana Meditation, mindfulness, Part-day Retreat and tagged #anapanasati, #breathmeditation, #brickcity, #kazi, #mindfulnessofbreathing #anapanasati #butterflymeditation #gilfronsdall #militarypark #brickcity #newarknj, #newarknj. Bookmark the permalink.